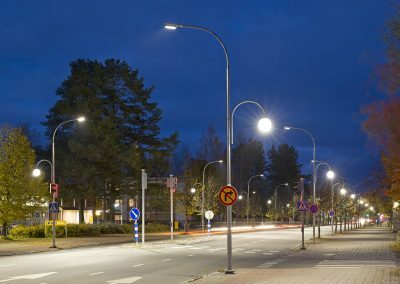 The main street in the town of Pieksämäki, Keskuskatu, entered the era of intelligent lighting in autumn 2014. This was just the beginning of the wide update process of the town's street lighting, but a significant part of it, being the most central street of the downtown area. Keskuskatu, the main street in Pieksämäki before and after the replacement of luminaires. 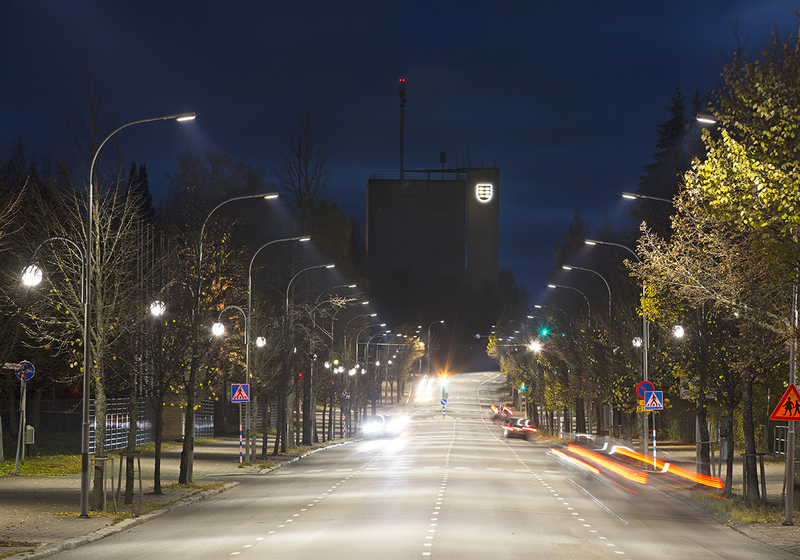 The main street in the town of Pieksämäki, Keskuskatu, entered the era of intelligent lighting in autumn 2014. 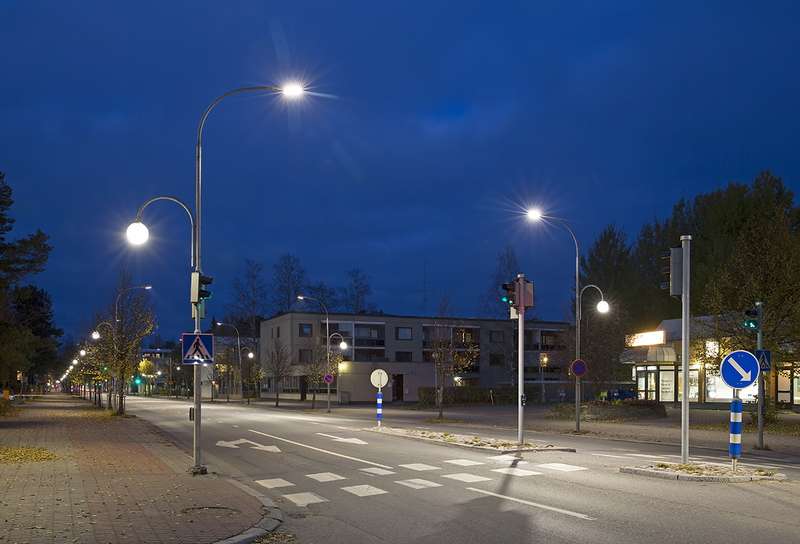 The existing lamp posts were retained but luminaires were changed to Valopaa LED luminaires. A total of 111 luminaires out of 220 LEDs along the street are now intelligent luminaires, using a wireless control system. 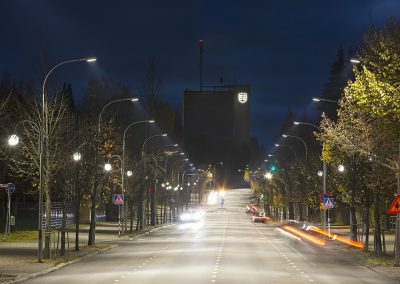 Pieksämäki town engineer Kirsti Valkonen says that the day came when she had to acknowledge the unflattering truth: the town´s main street was dark. “I was driving home one November night; it was drizzling a little. I suddenly realized that I couldn´t see! Of course, we had been talking about the lighting of our main street before, because of its high energy consumption and old globes falling down. We basically had old, ugly mercury vapor luminaires that had been outdated for years hanging over our main street. The final straw was the non-existent visibility in the dark,´ says Ms. Valkonen. The personnel of the town of Pieksämäki quickly grasped the opportunities of intelligent, controllable lighting. The brightness of lighting can be adjusted even for individual luminaires if need be. 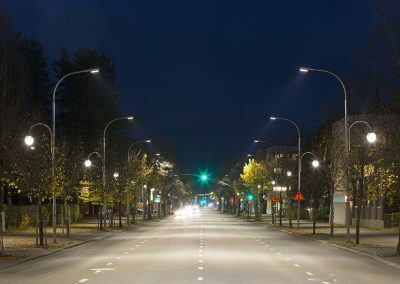 It seems very likely that the town of Pieksämäki will be able to reduce the originally designed maximum power and still achieve the required level of lighting. This means that energy savings will be even higher than expected – without compromising on safety! “This investment was our number one priority with regard to traffic safety in 2014. From the viewpoint of traffic safety and those using the street, lighting is crucial in terms of visibility in the dark, accessibility and moving around in the area. LED lighting shows colors in their nearly natural hues, which facilitates perception,´ says Kirsti Valkonen, listing the benefits of the modernization project. 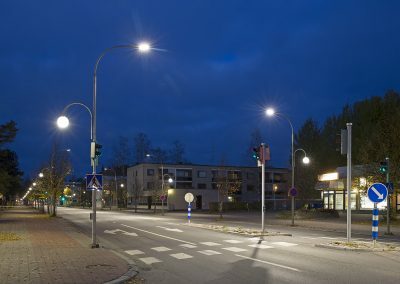 The intelligent luminaires in Keskuskatu, Pieksämäki, are compatible with the wireless MESH network. Transfer to the new network topology can be easily made by means of a software update. Cloud services and wireless lighting control will be commissioned in 2015.